The Endangered Ethiopian wolf is the only wolf species found in Africa and the most threatened canid in the world. Although loss of habitat threatens Ethiopian wolf populations, a new threat - the spread of rabies from domestic dogs - now threatens the species with extinction. With support from the Critical Ecosystem Partnership Fund (CEPF) through our investment in the Eastern Afromontane biodiversity hotspot, the Ethiopian Wolf Conservation Programme (EWCP) will address the urgent threat of rabies infection to Ethiopian wolves at the Bale Mountains Key Biodiversity in Ethiopia, which has already killed at least seven wolves. EWCP will implement an emergency plan which includes vaccination of domestic dogs in Bale, meetings with community leaders to spread awareness of domestic dog-related diseases, close monitoring of wolf populations, and the production of a "Disease Management Plan" for Ethiopian wolves. 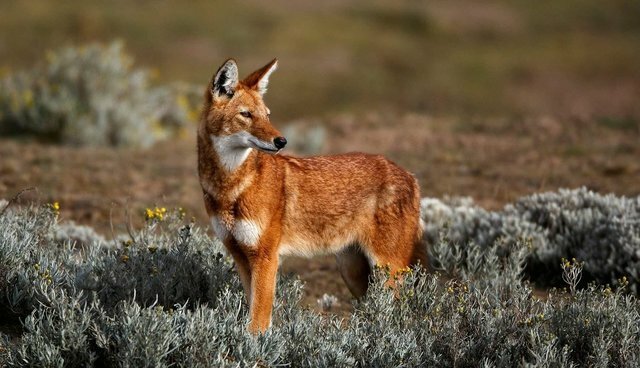 Learn more about the Ethiopian Wolf Conservation Programme. Established in 2000, the Critical Ecosystem Partnership Fund (CEPF) is a global leader in enabling civil society to participate in and influence the conservation of some of the world's most critical ecosystems. CEPF is a joint initiative of l'Agence Française de Développement (AFD), Conservation International, the Global Environment Facility (GEF), the Government of Japan, the John D. and Catherine T. MacArthur Foundation, and the World Bank. CEPF is unique among funding mechanisms in that it focuses on high-priority biological areas rather than political boundaries and examines conservation threats on a landscape scale. From this perspective, CEPF seeks to identify and support a regional, rather than a national, approach to achieving conservation outcomes and engages a wide range of public and private institutions to address conservation needs through coordinated regional efforts.